I'm a new member making my first post. 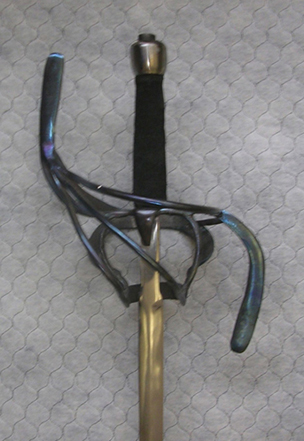 I'm researching methods and equipment required to try and reproduce a 3-ring swept hilt as a project; any good source images of museum pieces would be appreciated! If you're an experienced maker of hilts, what stories and advice do you have? What to be careful of, what to not try, and what methods work best? Originals were hand-forged, but what modern concessions do you make - do you arc weld, torch-braze, or hand-forge? Do you use a jig, just a vice or free-hand with an anvil? Friends come and go...enemies accumulate. 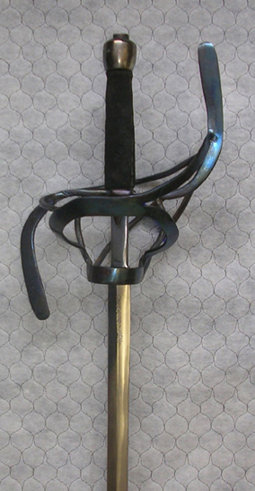 There are many hundreds of images of museum pieces on this site, several of which are 3-ring swept hilts. As a start, I would absolutely purchase a copy of AVB Norman's "The Rapier and Smallsword". It not only has a typology of the various hilt styles used, but it also goes into detail about the pommels and inner guards. I'm no hilt maker, but I would say that anyone attempting to make rapier hilts without this book would probably be spending a lot of time reinventing the wheel. This is a bit fortuitous...I was just about to post some pics of a swept hilt I finished recently for a left-handed swordsman - and no, "Princess Bride" fans, he has the usual compliment of fingers. I'll put them in here. I forge as appropriate, and forge weld where I can, but often resort to oxy acetylene. If you're a skilled arc welder it would be possible, but personally, I prefer oxy. It's less messy in my hands. I've never tried TIG welding, but I hear it gives good results. One of the pics shows a bt of a pit where the counterguards meet the knucklebow. Try to avoid blasting craters like that. (Physician heal thyself). For me, the main thing with a hilt like this is to finish the components as much as you can before assembling them. There's no fun to be had trying to clean up an area trapped behind a nest of bars. Also, do whatever it takes to make solid welds. Bevelling well to ensure a good fill helps a lot with this if gas welding. You can always take metal away, but it's tricky to add it. I work over-long and cut back to size. I don't usually work to a pattern, and tend to do things by eye. I work out general sizes with wire, allow a bit extra and adjust back. 1. Forge quillon block and quillons. 2 pieces in this case, forge welded together. The block sits over the quillon like a saddle. This may not be historically accurate, but works for me. The slot for the tang was done hot with a special slotting punch, which is shaped to leave a depression in the underside for seating the blade. Quillons bent over anvil horn and with bending fork. 2. Forge enarmes and side ring. Assemble these and fit to quillon. The rest of the hilt attaches to these. 3. With the essential bits done, other components can now be shaped to fit. Here, the larger bars were forged, but the counterguards at the rear were roughed out by cold bending, then adjusted with the oxy torch. Once assembled, tweak the lines if needed (rubber mallet and wooden block help here), clean up and finish as desired. This one was taken to 240 grit, then worked over with a hard sisal buff and coarse compound. The blueing was done in an electric kitchen oven on max. It took an hour or so to get the colour. Gas would be better, possibly. Oh, one more important thing: make sure the edges of the quillon are smooth and rounded where fingers will be wrapping - before it is all put together. This is not an easy adjustment to make if done after assembly. No mate, you'd be bronze-ish... I'm not THAT good! Happy to oblige, and good luck.